Stuff required: Pre-prepared scavenger hunt sheets; small bags; pens; shirts or tabards or sandwich-boards. Preparation: Scouting the area, preparing hunt lists, making signs. Time required: Twenty minutes upwards. Place required: A large public area with plenty of cover. A competitive scavenger hunt where the opposing players are the most valuable prizes of all. Prepare a scavenger hunt list appropriate to the playing area - a list of a dozen or so small items that could be found in the environment. This list should be divided into "easy" and "difficult" items, about half and half. Prepare a number of four-letter words (like BEES, FISH, WIRE, etc) for the players to wear. These should be written large enough to be legible at a distance. You could write them with soluble marker across the back of some cheap T-shirts, stick them onto marathon runners' tabards, or use A4 sheets of cardboard or paper which the players can tie or tape to their backs. Pick a large, clearly-delineated starting area for the game, with as many entrances as possible. This will serve as a "safe zone" when players return at the end of the game. Hand each player a list, a pen, a bag (to collect their items in) and a word sign, making sure that nobody else can read the word. You've been given a list of things to collect, and a word sign. When the game starts, you have two minutes to move away from the starting area. You can not collect anything during this period: just move away from the starting area, and put your sign on your back. Once your sign is on and two minutes have passed, collect as many items on the list below as you can, and put them in the bag. Each item is worth either one point or two points. On the outside of the bag, write down any words that you see on the back of any opponent. Each of these is worth three points, unless they also saw and wrote down your word, in which case it's only worth one point. When the game ends, return to the starting point with your bag. You will be docked one point for each minute that you're late. Once you're back inside the safe zone, you can take your sign off; once you've done this you can no longer collect any items or words. Instead of having physical targets and written words it's possible to use photographic targets, with players simply having to snap recognisable photos of one another for bonus points (it's probably a good idea to use ribbons or something as confirmation, as another player's blurry middle-distance photo of even your best friend might not be recognisable). Provide a list of tiny landmarks in the playing area that players have to find and photograph. Tiny landmarks are best, here, as the players will have to approach them (and risk being seen) to get a good photo. If you want to stamp out zoom-lens cheating, give players a toy or token that they have to place in shot next to each landmark. Try to make sure that everyone's using roughly the same level of camera tech, so that nobody has an advantage when snapping other players (long-distance zoom versus blurry cameraphone) - if necessary, you can ban the use of zoom, and penalise anyone caught using it. 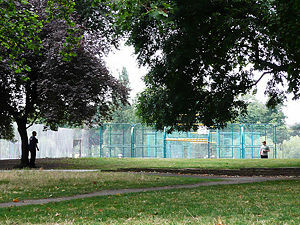 This item list was used for a game in a large public park, at the Stoke Newington Sandpit. This page was last modified on 23 June 2009, at 17:46. This page has been accessed 24,765 times.